When I reflect on my career I feel like I have been very lucky. Luck that I have worked very hard for, but still lucky and grateful. You see, I have been offered varied roles across my career. Some have provided breadth or width in experience across an organisation. Others have had depth in a specialist or narrow field. When I look back I don't think the roles I sought out were a conscious strategy on my part, but it has meant that each role I have taken on has given me a new opportunity to learn and grow and move forward. I'm going to give you some examples of my career in Human Resources (HR) but I suspect the "breadth and depth" idea works across many functional and business areas. My first role in HR was for a National niche insurer. It was a great role because I was able to get involved across a huge range of tasks. I learnt how to put employee inductions together, how to write Board reports, how to influence Senior Male Managers (when I was young, female and inexperienced), how to recognise employee performance and lots more. I got to touch lots of different areas across that business. It was a perfect first professional job. Having had a little experience in a smallish business, I wanted to see how a large company "does" HR and work within a larger team. I landed a generalist role in a very large business. The skills I learnt in my previous role were immediately applicable and I also learnt a lot. My manager was located overseas so it was my first experience working across different time zones and learning to manage "up". I worked with many different cultures and got to travel all over the world. I learnt to be aware of and negotiate organisational politics and deal with conflict and team dynamics. The opportunity to concentrate in one particular area of HR gave me a chance to learn specific skills in a discipline that is more strategic. I focused on management and leadership development and employee engagement and gained invaluable skills in working with challenging personalities in quite a "blokey" industry. Most importantly I learnt that cultural fit is SO important in being able to do a good job and feel successful. I learnt lots of good skills and lots about myself in this role, including knowing what I don't want in my career. A similar role to the previous company but a very different organisational culture. I got to work on some very specific projects, met and worked with some fantastic people and generally just had a great time. Doing a contract role was a great idea. It gave me a "taste" of working for an iconic company and improved my confidence for my next role. This role was my first role as part of a leadership team, instead of just being part of the HR function. I had the opportunity to contribute beyond HR issues and had a "seat at the table" with the other business areas; finance, marketing, sales, operations and customer service. I learnt to influence and coach my peers, have input over decisions that affect a complete business and support and improve a great organisational culture. Again a role as part of a leadership team but with the opportunity to expand my change management and business integration skills across a broader business with significant challenges and a larger team. Overall, what have I learnt? Unless you are in a fairly senior role, large organisations with lots of employees often means you will gain experience in a specific area or business unit - depth. Working in a smaller organisation may give you more opportunity to try your hand across a wide variety of areas and potentially gain valuable experiences that may not exist in larger organisations - breadth. I have found that moving between larger and small organisations very helpful in building great work experiences throughout my career. I have worked for 3 little known companies and 3 very well known companies. They were all good experiences. The little known companies I worked for provided fantastic career development, as did the well known companies. Having the well known company name and experience on my resume meant that I'm more likely to get an interview for the next job. I don't think the experience I gained at these companies was any more valuable, but as a candidate I am more marketable. Worth thinking about. Changing roles and companies is hard work. Usually it takes effort to find a new role in the market so make it worthwhile. Be clear about what you want to learn in your next role. Be clear about the kind of organisational culture you want to work in. Be clear about what kind of person or people you want to work directly with. This could be your manager or internal customer, for example. Interviews are a two way street. I'm not the best example of this but I suggest working in organisations with different business models. I have mainly worked in "Public" or "Listed" companies, with some experience in privately held organisations. Some experience in "not-for-profits" and government organisations would round out my career. Variety could also be in the type of employment arrangement. I have mainly worked in permanent full-time roles but have also done some contract and temporary work. These were valuable in gaining specific experience in a short time. 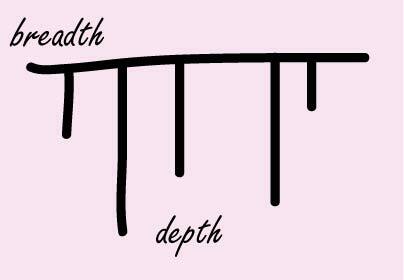 Do you have breadth and depth in your career? Do you want breadth and depth in your career? Would love to hear about it!